RRB Thiruvananthapuram has released RRB ALP Answer and Objection Link. The Link is activated from 14th September 2018 (9:00 am) to 19th September 2018 (23:55 Hours). Click here to click RRB ALP Answer Key 2018. RRB Thiruvananthapuram is one of the RRBs of India. The Recruitment Board of Thiruvananthapuram recruits the “Group C” employees of Thiruvananthapuram, Palghat and Madurai Division of Southern Railway. The candidates those who are selected in this recruitment exam can be posted anywhere on Southern Railway. The selection of the candidates is on the basis of the merit and rules designed by the Ministry of the Railways. This year the Railway Department has conducted the world’s biggest online exam which will recruit almost 2.5 Lakhs of candidates for various positions in the Railway Department. 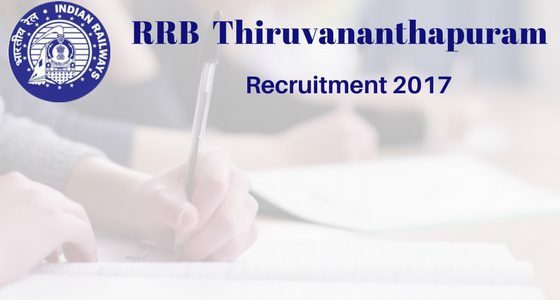 02/01/2019 Latest Update: RRB Thiruvananthapuram JE Application Form is released. Click on the link and Fill your Application form before 31/01/2019. 26/12/2018 Latest Update (RRB Thiruvananthapuram JE Recruitment): RRB has released the official notification for RRB Junior Engineer 14,033 posts. The candidates can read the notice in PDF below. 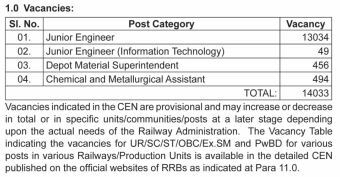 The Junior Engineer Recruitment from RRB Thiruvananthapuram has been released for 14,033 posts. The candidates are advised to check the dates for the RRB Thiruvananthapuram JE Application Form 2019. The Applications will be carried out in the month of January 2019. All the candidates are required to check if they clear the eligibility criteria before filling the application form. Following dates are announced. Railway Recruitment Board of Thiruvananthapuram will soon announce the RRB Thiruvananthapuram JE Vacancy 2019 for the candidates. In the official notice for the recruitment drive, candidates can check the RRB JE Vacancy, RRB CDMS Vacancy, and RRB CMA Vacancy. it is advisable to wait for the official notification for the release of the confirmed RRB Junior Engineer Vacancy 2019. Railway Recruitment Board of Thiruvananthapuram has released the confirmed dates that RRB Thiruvananthapuram Jr. Engineer Online Forms. The candidates should read the official notification and confirm their eligibility criteria. Following steps can be taken to fill the application forms. The candidates of the Southern India region are preparing hard for the exam that is conducted by the Railway Recruitment Board. The exam will be conducted in two phases. In the first phase an approx. of 1.5 Lakh candidates are selected and the rest will be recruited till 2019. So if you are preparing to get a job in the Railway field then this a golden opportunity for you. Nationality Criteria: The candidates who are applying for this exam must hold Indian Citizenship. The candidates appearing for the exam must have passed the 10th/ 12th of ITI Degree from a recognized University. The ITI Certificate is applicable for all the above exams mentioned. The candidates those who are preparing for the exam must be on the age bar of 18-30 years. The relaxation is given as per the Government Rule. The Application fee of the candidates is Rs 100 for the (General/ UR Category) and for the ST/SC and OBC Category and the Women Candidates the application fee has been exempted. The Railway Recruitment Board is conducting the filling of the application form as well as the online exam completely online. The RRB Thiruvananthapuram has its own official portal for the online application process. The notification will be notified in the newspapers and employment news. The candidate are requested to submit their Aadhaar while applying for the application form. The inclusion of Aadhaar number has been made mandatory by the Government. If the candidate does not own an Aadhaar Card then he/she has to visit the Aadhaar enrollment center and register yourself. It is so because the Indian Railway in this year has decided that the verification of the candidates will be done through the Biometric process. Now coming back to the topic, we will now provide you the information of how to apply for an Aadhaar card online. When you visit the home page of the portal, search for the link that says “Employment Notice”. Click on that link. After clicking the link you will be redirected to the recruitment page of the RRB. Here you can see the option “CEN 01/2017 and CEN 01/2018”. Click on the link and the read the instructions/details regarding the vacancy carefully. After reaching the online application system, fill in the form with required details. Aapko khud decide krna hoga ki aap RPF ka exam dena chahte hain ya RRB ALP. I have polytechnic diploma in computer engineering. Can I apply..? i tired to find out a such link to apply.its fake sites open,pls help.